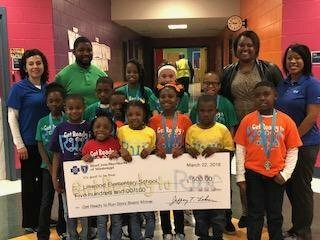 On Saturday, February 3, 2018, students participated in the Get Ready to Run Kids' One-Mile Fun Run in Ridgeland, MS. The Get Ready to Run Program introduces students to the benefits of running, physical fitness and healthy lifestyle choices in a fun and rewarding way. Each student received a race t-shirt, blue shoelaces, and runners' bag. Also, schools were eligible to win 1st, 2nd or 3rd place based on the school with the highest percentage of student population and $500 for the best story board depicting the "Get Ready to Run" theme. We are please to announce that Linwood won the storyboard competiton.